If you have any interest in Japanese cinema, animated or not, you don’t miss a chance to see a new film from Studio Ghibli. Last night I was lucky enough to catch a screening of コクリコ坂から (Kokkuriko Zaka Kara – From Coqueliot Hill – released as From Up on Poppy Hill), released last summer in Japan, and not due in English-speaking territories until 2013, if at all. Directed by Goro Miyazaki but with a screenplay co-adapted by his father, it’s a more straightforward film than most recent Ghibli releases, with none of the magical realism or flights of fantasy. 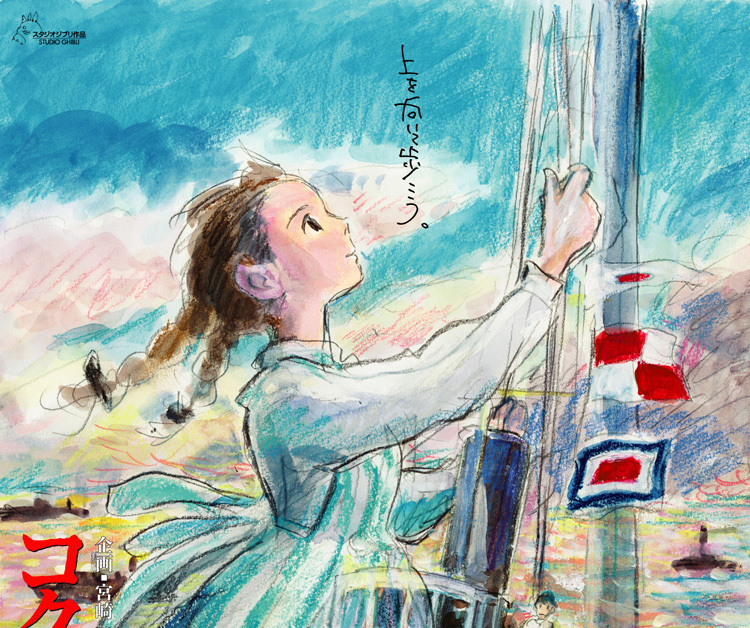 That could be in part because it’s adapted – from a shoujo manga, in this case – but Poppy Hill also notably lacks the environmental themes that Miyazaki Sr worked into even his adaptation of the Borrowers (借りぐらしのアリエッティ). Instead, this is a fairly straightforward coming of age story set in 1963-64 (if I remember right from newspaper cuttings shown) Yokohama. Matsuzaki Umi, eldest daughter of the central family, runs a guesthouse and goes to school, where she meets Kazama Shun, who runs a school newspaper from out of a fantastically wrecked clubhouse called – inexplicably – the Quartier Latin, which is threatened with demolition. Given that hint of narrative, you could probably take a shot at guessing the rest of the plot. But that’s not really the point – this is, more than anything, nostalgia, and the glorious hand-drawn animation works brilliantly at conjuring up an often twilit lost world of mid-60s optimism as Japan prepares for the coming Olympics, and on that level it’s hugely enjoyable. The soundtrack is also notably marvellous. Sadly I wonder if this Japan-centric subject matter will limit the likelihood of a wide release in the UK and abroad, so if you do get a chance to catch From Up on Poppy Hill at a film festival, grab it with both hands. Oh, and a side-note: if you’re studying Japanese, most of the language in the film is pretty straightforward, so pick up a Japanese R2 DVD maybe.